The starting point of a new era! Back in 1996 when i saw the first ads for this device, i was thinking "this looks like a good little machine, created by a newcomer in this market (US-Robotics). I'd like them to succeed!". 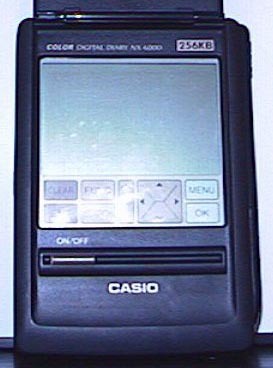 Years later, "Palm" has become a generic word for this whole PDA breed. Plus, the newton family members were large and heavy, as opposed to the light and foldable Psion family devices. The keyboard family was thus the reasonnable choice for most people. PC Connection was then quite common, already, but in most cases the connection kit was only available as an option, for extra cost. SO, what was the big thing that set the standard? I think they were numerous. Instead of one big idea defining the device, the Palm brought together several good sides that were usually not available all at once before. I think the first -and maybe the major- good idea was the PC synchronisation. 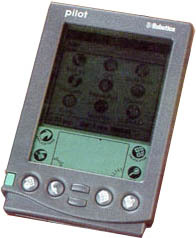 When most other manufacturers offered PC connection as an option, the Palm came packed with a connection cradle *and* a synchronisation software that would instantly transfer all your data into your PDA by the touch of a button. This was also made a big marketting point. Then, there was Graffiti. Although already presented in earlier devices (see the HP Omnigo), graffiti was then included in a smaller, lighter, and simpler device, as a quick and reliable way to enter data on the go. And among other good points, there was the possibility to expand a Pilot's possibilities by adding new applications directly inside the main memory. We could say that the Palm gathered the best of two worlds : it was smart, with a useful power, just like the newton family members; and at the same time, it was compact and small, with simple to use applications just like the psion family. The Pilot 1000 and 5000 really started the revolution that the Newton was aiming at. As such, this machine here is the father of all the Palm/winCE devices we now live with! RAM : 512KB? ROM : ?? 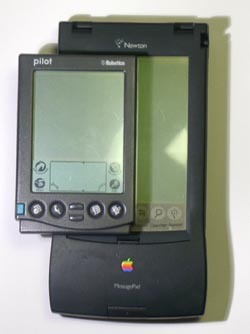 Geek fact of the day : the original Pilot is almost exactly the same size as the Apple Newton screen. No need to say, the Newton is thus huge compared to modern PDAs. The Newton however benefits from the bigger size : it has a bigger, better resolution screen (240x320 instead of 160x160) and more interfaces and connectivity. Still, newer machines the size of the original Pilot came out with better specs than the newton, as a proof of evolving technology. Apart from the appealing price, i think what made the difference in making the Pilot a worldwide success where the Newton failed to actually create it's market is the compact size.